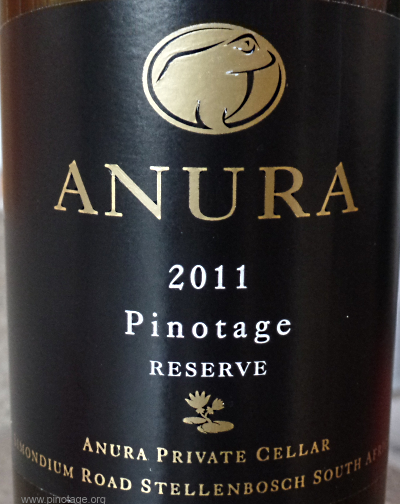 My Wine of the Month for November 2015 is Anura Pinotage Reserve 2011, a very satisfying classic Pinotage with a fine sturdy core, sweet berry fruit edge and just a trace of mocha. Anura is a bit off my radar, they don’t seem to be available in the UK so they’re not the first producer that comes to mind when I think Pinotage, but I’ve enjoyed the few I’ve encountered and they have always impressed. I’ll get some more when I’m in the Cape in a couple of months time. I wasn’t the only one to be impressed with this vintage, as it was a worthy Top 10 winner in 2013. 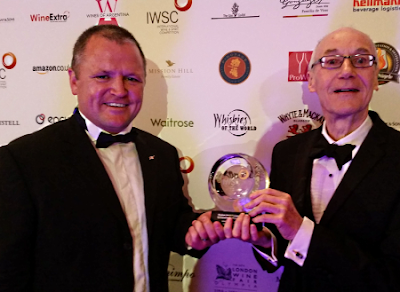 Kanonkop Estate was the toast of the IWSC Awards Banquet held on Thursday evening 26 November 2015 in the splendour of London's Guildhall. Abrie Beeslaar won Winemaker of the Year Trophy 2015. This is the second time Abrie has won. The prestigious, Winemaker of the Year 2015 is Abrie Beeslaar, who has been recognised for his work at Kanonkop Wine Estate, South Africa. Having received the award previously in 2008, Abrie is taking his favourite grape, Pinotage, to new realms of quality - striving for balance structure and elegance. 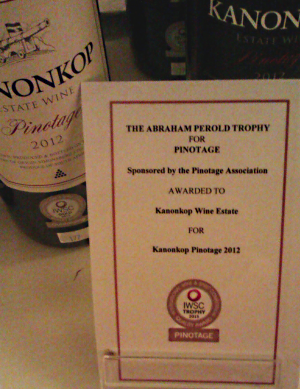 Black Label Pinotage 2010, Pinotage 2012 and Black Label Pinotage 2012 all received Gold Outstanding medals, but the judges selected the Pinotage 2012 for the Pinotage Trophy. I tasted all three at the event and the Trophy winner was immediately beguilingly attractive and I think that gave it the edge. The two Black Labels were tighter and more closed, presumably having been made for longer keeping with a higher proportion of new oak. 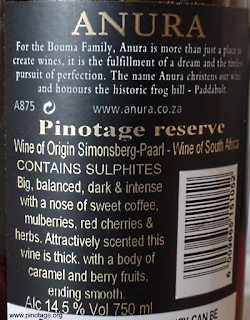 The 2012 Black Label had 18 months in 100% new oak barrels, and the 2010 16 months in 100% new oak barrels, the 2102 Pinotage had 16 months in 75% new and 25% second fill barrels. Sommelier Mark Cochrane held a tasting for The Millstone, Ontario, newspaper comparing "the traditional wines made with 'South African signature grapes' against the new style of wines being planted in South Africa." Chenin blanc and Pinotage in Team Tradition competed against Team Newbies' Sauvignon blanc and 60/40 Shiraz/Cabernet Sauvignon blend. Result? "The overwhelming preference was for the older style wines like Pinotage and Chenin Blanc which demonstrates that some wines can stand the test of time." 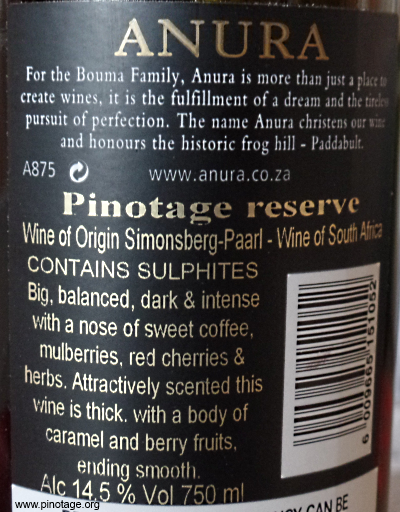 But not too old style for the red as the Pinotage was The Grinder, one of the new fashioned 'coffee/chocolate' wines. Mark bought the wines from Ontario's monopoly LCBO and it seems someone there really likes that style as they form half the 8 varietals available! Read the full report in The Millstone from Mississippi Mills Ontario, Canada.